Paxton: Please design us a mechanism that is simple, elegant and very reliable. 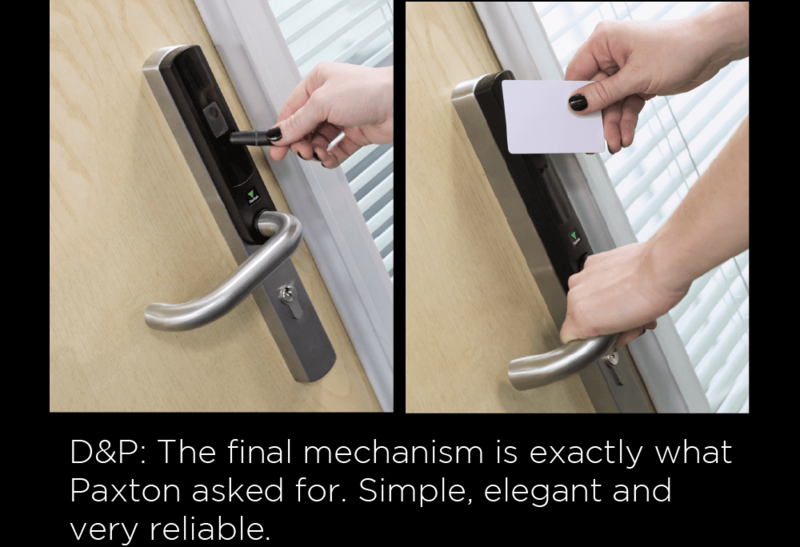 Paxton asked D&P to design a simple and reliable mechanism for their Net2 PaxLock product which is a networked access control product in a door handle. D&P: The final mechanism is exactly what Paxton asked for. Simple, elegant and very reliable. The final mechanism combines elegant design with the practical functions needed for the project. The resulting product is very easy to factory assemble and requires no maintenance. Paxton now have a market leading, robust and reliable product in Net2 PaxLock. 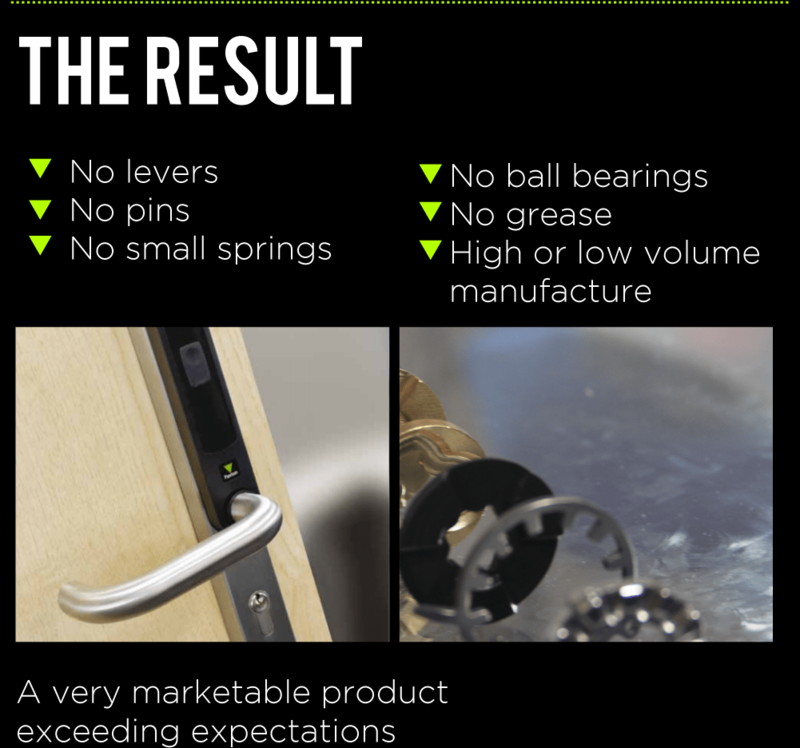 This was a tough challenge, to design an internal mechanism for this RFID door handle in a confined space, and the company had been looking for something like this for a long time. 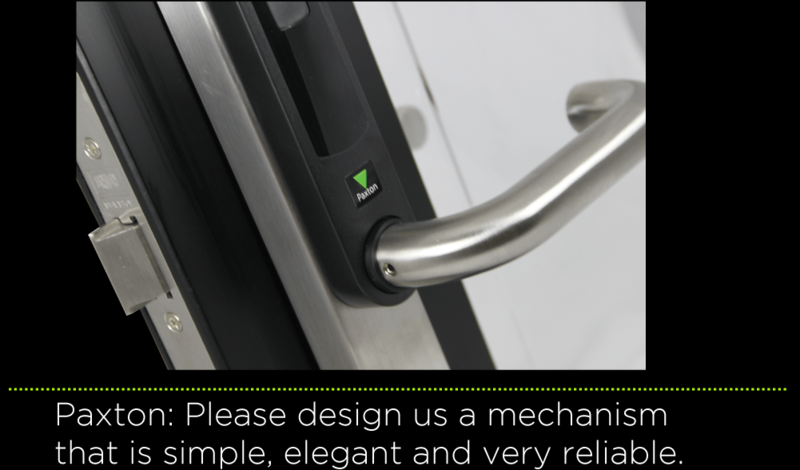 Paxton now have a market leading, robust and reliable product with Net2 PaxLock. The most important thing we did was to listen carefully to what the client needed and deliver exactly that. We were able to rise to the challenge and get the job done within the set boundaries and requirements. Our engineering design and expertise have helped produce a commercially viable and perfectly suited design answer to Paxton’s brief. The work on the project included: ideas, sketched concepts, 2D visuals, R&D, 3D CAD, test rigs, prototypes, electro-mechanical design, assembly design, engineering drawings, critical analysis of development work and component procurement.